I have breathlessly anticipated the languid warmth of 70-degree weather since the first cherry blossoms began to ripen across our fair city. Warm weather means golf, summer dresses, romantic strolls around the monuments and idyllic hours of conversation dining al fresco in one of the plethora of eating establishments in D.C.
A foremost entry in outdoor dining is the gem Poste Brassiere. Tethered to the Hotel Monaco, the actual entrance to the restaurant is hidden around the corner on 8th Street. The restaurant’s facade, with its glistening floor-to-ceiling windows and soft lighting, called to us, daring us to have a memorable evening. Fortuitously enough, not only did we receive a bit of divine intervention in the form of breathtaking weather, but we also, conveniently enough, had come upon an outdoor wedding reception. Guests were mingling outdoors with a bit of jazz to break-up the soothing clatter of silverware on plates and gentle murmur of happy conversation. “Wow,” was Dan’s succinct comment to the rich and soulful ambiance. We sat down and began with drinks. Poste is known for its house-made, vodka-infusioned mixes. I passed on a mixed drink and went straight for my favorite wine: the “Sokol Blosser Evolution,” a crisp, fruity white wine, with a basic texture and an easy finish. Dan ordered the mixed drink special “Spring Fling.” When it arrived in its cheerful martini-glass, I was skeptical. I thought about how much it looked like a mimosa and certainly hoped Dan was getting his money’s worth. He sipped. He smiled. He beckoned. “Drink,” he said. So I did and with the first swirl of the cantaloupe and terragon infused vodka, peach nectar and lime juice in my mouth I instantly became unquenchable. Luscious in its sweet sinfulness, one sip of the “Spring Fling” quickly turned into two … and … well … I had to give it up before I gulped the entire drink down! Appetizers were jointly settled. One came from “The Garden” section. Escargots. I’ve never had escargots but for $10 we figured it was worth an adventurous sample. I will confess my main concern was not whether I would get my money’s worth, but to assiduously avoid a Pretty Woman-esque moment! 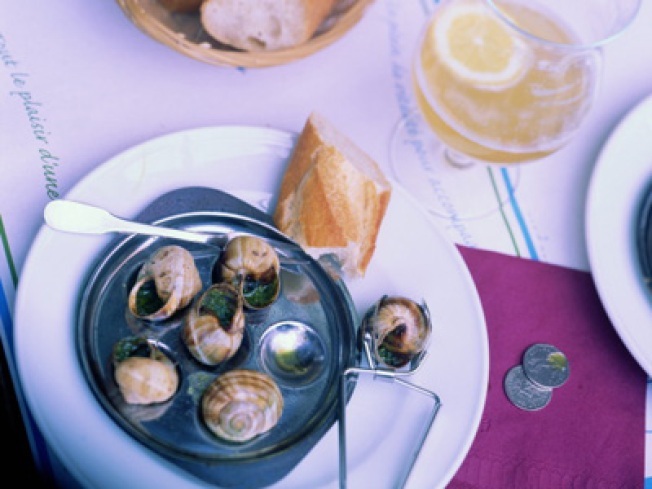 Served in tiny silvers the size of a penny, the shelled escargot rested on an equally diametered biscuit and positively swam in a sea of garlic-lemon butter. Quaintly enough, the 10 escargots came not together in a single dish but rather in equally tiny bowls within a dish, almost like a muffin pan but smaller and round instead of rectangle. Beautifully textured in both taste and smell, the escargots were the most memorable food of the evening. We also ordered the “truffle fries” because no one should go to Poste Brassiere and not order the truffle fries. Served in a newspaper shaped in a cone, they are essentially French fries cooked in olive oil and basted with herbs. Neither too thin nor too greasy, the truffle fries are an excellent complement to any meal. For our entrees, Dan ordered from “The Pasture” -- the Beef Bourguignon. Made with ribs and cheeks, roasted fingerlings and organic vegetables served in a stern iron skillet, Dan proclaimed its magnificence. “Mmmm … good.” Coming from me, this may not mean much, but coming from a man who grew up with red meat this certainly said something positive! I ordered from “The Ocean” -- the crispy skin wild striped bass. Made with champ potatoes, red wine poached farm egg, caper beurre noisette, the bass was tender – yet still crispy (obviously) – resting gently in a bed of mashed potatoes. The only off-putting part of the dish was the singular poached farm egg laying on top. “What is that?” I questioned gauchely, my burger-and-beer diet not registering a delicacy. Dan and I removed it to the side of my plate where I gamely hit it with the tip of my fork. That’s when the yolk came through the poached farm egg – and also when I realized my lack of food expertise (Mark Bitten I am not!)! Again, very good. By this point, I could not even begin to contemplate dessert. Our waitress was kind and understanding of our full stomachs and offered us a small plate of sample desserts on the house. A bitter chocolate truffle; a smidgen of a cake of indeterminable origins; and an almost shrimp-like concoction which tasted slightly tart-y but, again, of indeterminable origin. We were grateful for the free dessert sample, but I’m not sure what to think of the dessert. I didn’t NOT like it … it just wasn’t as memorable as the drinks, appetizer and entrée. Overall, I would say the food at the Poste Brassiere is of a better quality than some of the sister restaurants owned by the Kimpton Company – Urbana being a perfect example of excellent ambiance, delightful drinks and so-so food. With the outdoor courtyard officially opening this Wednesday at 5 p.m., I would recommend quickly making reservations for the month or so we DCers have of exquisite weather before the humid heat becomes unbearable. And, maybe if you’re lucky enough, you’ll have jazz to carry you through a romantic candlelight dinner for two.